Kimberly Patterson, of Weirton, who directs West Virginia Northern Community College’s online education, has been awarded the Certified Online Instructor designation. The certification program provides professional development and recognition for instructors of online courses. “We are pleased to recognize Kimberly Patterson’s expertise and experience in this growing area of teaching,” William A. Draves, president of the Learning Resources Network, the international education association awarding the COI designation, said. The Certified Online Instructor designation was developed by a committee of outstanding online faculty from universities and colleges in four countries in response to the need for recognition of expertise in this important area of higher education instruction. Patterson is Northern’s instructional designer/online education coordinator. 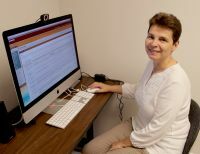 She was instrumental in Northern becoming the first two-year college in the area to offer programs that can be completed totally online. The committee reviewing COI designations is chaired by Dr. Mary Dereshiwsky, COI, of Northern Arizona University in Flagstaff, Ariz. The faculty for the COI designation includes experts and authors in the field of online teaching. To obtain the COI designation, Patterson completed a fairly rigorous process. Requirements included a critique of her online courses, a knowledge exam, evaluation by online students participating in courses that she instructed and completion of three online courses for teaching online, designing online instruction and building learning communities in cyberspace. The certification is a voluntary program recognized by educators and the Learning Resources Network’s 5,000 members around the world. The Learning Resources Network is the leading provider of online professional development for faculty in higher education. More than 5,000 professors from 10 countries have participated in LERN’s programs.